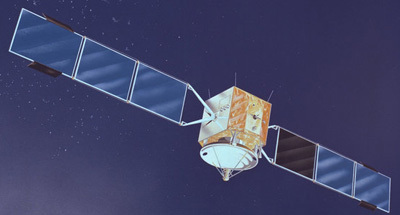 The MARECS (Maritime European Communications satellite) satellites were members of Inmarsat's first generation global maritime communications network. The program began as the experimental Maritime Orbital Test Satellite (MAROTS) in 1973, but was subsequently changed to an operational system resulting in a name change, a satellite redesign, and delayed development. MARECS is operated by ESA for Inmarsat. Based on British Aerospace ECS platform. 3-axis stabilized to 0.2 deg (pitch, roll) using fully redundant momentum wheels, thrusters, and nutation dampers. Redundant sun sensors provide 0.04 deg knowledge. Two sun-tracking solar arrays provide 955 W (BOL) with 2 NiCd batteries for eclipse power. Hydrazine propulsion system for station-keeping. Three repeaters: shore-to-ship with 5 MHz bandwidth, ship-to-shore with 6 MHz bandwidth, shore-to-shore with 0.5 MHz bandwidth. These provide 35 two-way voice channels plus search and rescue capabilities. One 2 m diameter L-Band antenna and 2 horns (one transmit, one receive) for 4/6 GHz channels. All antennas have full Earth coverage.